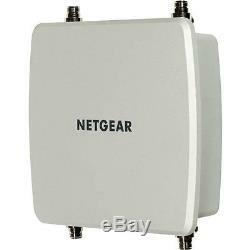 Netgear WND930 IEEE 802.11n 300 Mbit/s Wireless Access Point - 2.40 GHz, 5 GHz. High Power Dual Band Concurrent Access Point Maximizes wireless coverage with superior outdoor access. Extends wireless coverage to outdoor with the high power WND930 Access Point. The WND930 Access Point combines industrial and robust design with flexible antenna options, and dual band (2.4 and 5 GHz) concurrent operation for optimal outdoor deployment. The WND930 Outdoor Access Point is powered by redundant dual Power over Ethernet (PoE) gigabit ports as well as the capability to power other PoE devices. The WND930 Outdoor Access Point operates under harsh environment with its industrial grade IP67 enclosure and an embedded heater to allow the Access Point to operate in below freezing point temperature. Through its user friendly interface and mounting accessory kits, the WND930 Access Point can be configured and installed easily in less than 10 minutes. Product Name: High Powered Dual Band Outdoor 802.11n Wireless Access Point. Product Type: Wireless Access Point. Wireless LAN Standard: IEEE 802.11n. Total Number of Antennas: 4. Number of External Antennas: 4. Wireless Transmission Speed: 300 Mbit/s. Number of Network (RJ-45) Ports: 3. Weight (Approximate): 4.18 lb. High Powered Dual Band Outdoor 802.11n Wireless Access Point. Our mission at BuyVPC is to be your preferred shopping destination and provide you an exceptional experience in all channels by delivering outstanding value, top of the line customer service, and continuous innovation. We strive to not only offer you everything you are looking for, but to provide products at the best price possible with the customer service you deserve so you will want to shop with us again and recommend us with confidence. BuyVPC takes customer privacy seriously treating all private customer information with the utmost respect just as we would expect our own private information to be treated. BuyVPC DOES NOT sell or provide customer private information to unauthorized 3rd parties. In general information is only shared on a need to know basis for commercially acceptable purposes. Information may be shared with BuyVPC'S staff, employees, agents and BuyVPC authorized 3rd parties for the purposes of fulfilling orders, leveraging customer discounts, rebates, issuing of credit, invoice collection, our own marketing purposes and other commercially acceptable purposes determined by BuyVPC management. BuyVPC takes commercially reasonable measures to ensure the privacy of your information including the use of firewalls, intrusion prevention systems, security software / devices, encryption, vulnerability assessments, PCI and other compliance programs. This listing is currently undergoing maintenance, we apologise for any inconvenience caused. The item "Netgear WND930 IEEE 802.11n 300 Mbit/s Wireless Access Point WND930-100NAS" is in sale since Saturday, October 03, 2015. This item is in the category "Computers/Tablets & Networking\Home Networking & Connectivity\Wireless Access Points". The seller is "buyvpc" and is located in Kenosha, WI. This item can be shipped to United States.